LIGHTS are installed in Windsor Square. 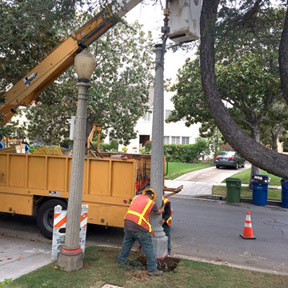 Ninety-nine new or rehabilitated lampposts, all with bright but long-lasting and energy-efficient bulbs, have been installed in much of Windsor Square, thanks to residents who took up the challenge to promote a streetlight assessment project. The lights are being placed in Windsor Square between First and Third streets, from Beachwood Dr., Plymouth to Irving boulevards. The additional lampposts, which are very similar to the original ones installed in the 1920s, have been financed by the property tax payments of abutting property owners seeking to increase safety and aesthetics. Better lighting will help address long-standing problems with illicit activity previously occurring after dark on unlighted neighborhood streets, said resident Paul Newman, a member of the Windsor Square Association streetlighting committee. He worked with neighbors to gain support for the assessment, which totaled $885,848. The project cost included a city contribution arranged by Councilman Tom LaBonge of more than $1 million.